Amazon is continuing to roll out some pretty eye-catching deals on PC components for the holiday season, and their most recent blitz is around, implausibly, PC cooling. 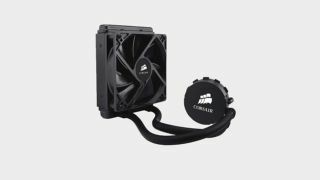 While there are a bunch of cooling solutions available in the current sale, some of them are pretty suspect or only very marginally discounted. On the other hand, getting 22% off Corsair's Hydro Series H55 AIO liquid CPU cooler (sale price of $49.99) is pretty tasty, if only because even at full price the H55 is a pretty great value. For anyone who's ever looked to add aftermarket cooling to your CPU, you know how much of a pain fitting one into an already crowded case can be. The H55 solves that problem with a slender, svelte (but still very effective) radiator, meaning it won't get in the way of even bulkier heat spreaders on your RAM or any unfortunate snake of bundled cables extruding from your PSU. Since it's often these crowded cases that cry out most for a third-party cooling solution, the H55 is a godsend for anyone who has added components without upgrading to a larger case. But even for someone with a well-ventilated case, the H55 is a peace-of-mind upgrade that will ensure you never have to worry about the temperature of your CPU without adding any significant noise to your rig. You could definitely spend a whole lot more on more elaborate cooling solutions, but the H55 is a targeted solution that will instantly solve your CPU heat issues with minimal installation and minimal additional noise. Getting it for less than $50 makes it even more appealing.